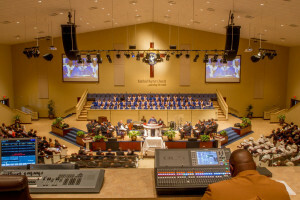 Fairfield Baptist Church, in the Atlanta suburb of Lithonia, featuring RoomMatch® loudspeaker system from Bose® Professional. The worlds of house of worship and music are closely linked, with an enormous amount of work going into making a church the kind of environment suitable for music while delivering the message. These were the primary concerns of Alfred “Al-Tee” Williams, a leading live-sound engineer whose front-of-house and monitor mixing credits include Jay Sean, Kool & the Gang, Fantasia and most recently, Ludacris. It was while mixing front-of-house for Ludacris last year at premier music venue Park City Live during the annual Sundance Film Festival that Al-Tee first encountered the RoomMatch® loudspeaker system from Bose® Professional. As soon as he experienced it, he knew it was the right solution for his church, the 129-year-old Fairfield Baptist Church, in the Atlanta suburb of Lithonia, where music is an integral part of the worship service led by Pastor Micheal Benton. “We were having a lot of trouble getting good coverage to all of the seats, and the low-frequency response we were getting from the existing system was just not what we needed,” Al-Tee explains. The system was designed and installed by Al-Tee (and his company, Omny Pro Productions) and it is composed of two L/R arrays, each using three symmetrical and three asymmetrical modules. Four RMS218 subwoofers deliver strong enough bass to serve a hip-hop show. In addition, two RoomMatch loudspeaker modules are used for side fills on the outside of the left and right clusters, while four RoomMatch Utility RMU208 loudspeakers are employed for front fills. The system is powered by 10 Bose PowerMatch® PM8500N amplifiers fitted with 10 ESP Link Cards. Finally, the system is managed via a Bose ControlSpace® ESP-880 engineered sound processor. The church was able to take the system a step further by using an Audinate Dante™ Card for the ESP-880, putting it on a Dante digital audio network.